Tom McArdle is Turnbull Mfg. Co.’s in house metal engraver. Tom has been engraving for 17 years and has been doing the engraving work at Turnbull for 6 years. He learned the craft at Montgomery Community College in North Carolina on the GI Bill while taking night classes. He was originally enrolled in their gunsmithing program but switched to engraving after seeing the beautiful engraving work the students were able to produce after only one year of training. Tom uses a traditional hammer and chisel or other hand pushed tool along with a magnifying glass to do a lot of the engraving. This is the same technique that has been used for hundreds of years. At times he uses air powered tools, which have become popular in the industry in the last 30 years. When using the air powered tool he must still direct it by hand. The pneumatic tool provides a very clean cut and is most often used on modern pieces. When restoring older firearms it is important that they have an authentic look. In these cases he would use the traditional hammer and chisel method. None of the engraving work at Turnbull is done by computer programming. The engraving work done at Turnbull is meant to last for several hundred years. The amount of wear on the engraving depends on a few factors. First is the delicacy of the engraving, finer more intricate designs will wear away quicker than simpler designs. 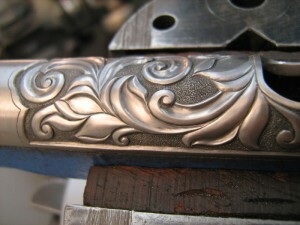 The placement of the design on the firearm also determines how long the engraving will last. Finally how often the firearm is used and handled will play a factor into how well the piece will age. Tom’s favorite projects to work on are on the opposite ends of the spectrum. He enjoys doing lettering work which is a relatively short project and he also likes to experiment with new designs and use his creativity however it is rare that he has the opportunity to do experimental work. Tom likes to work on lettering because it is extremely difficult to engrave letters that are high quality. People see perfect lettering every day and any mistake in the engraving is easily detected.